I love Sharon Srock’s books and when a new one releases, I’ve just gotta read it! The latest and greatest is Begging for Mercie. 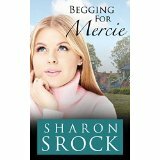 It is the second book in the Mercie Series following For Mercie’s Sake. Scottlyn Rich was violated in the worst way but chose to see the blessing that God would bring from her pain. She’s grown up far faster than she should have had to but she’s matured into a woman who loves the Lord and longs to serve Him. She’s put the past away and is taking steps toward her new life and just when things seem to be moving forward without resistance, Scottlyn gets court papers that threaten to rock her world. Penny Nelson has suffered the loss no mother should have to face…the loss of her child. The pain is so heavy that she is disintegrating beneath it but her husband loves her too much to allow that to happen. Through his love and God’s grace, he challenges Penny to find the strength to forgive and to move through her grief. Begging for Mercie is a story that will have you cheering for Scottlyn and praying for justice while simultaneously tugging at your heart as you experience the sorrow of a grieving parent. It is a great story demonstrating what it means to love others as Jesus loves. I received this book from the author and have provided my honest review in exchange.